Continuing our six-part series on the GP’s role in cancer management, this ﬁrst of two articles on cancer ‘survivorship’ explores the issues cancer patients may face after the acute treatment phase is over. Many patients in the post-treatment phase of cancer face just as significant medical and psychosocial issues as those undergoing diagnostic tests or oncological therapies. These include the increased risk of developing second and metastatic cancers, the development of late- and long-term effects of cancer treatment, emotional issues such as fear of recurrence and the psychosocial and financial impact on their own lives and that of their families. The national survivorship programmes in the UK are now addressing the unique health and social care needs of people who have received treatment for cancer in the recent past or of those who have survived to experience the late effects of treatment. The former group may be within months of treatment and have problems related to their diagnosis and treatment. Late effects of treatment may appear within months of treatment, but may become evident only after several years. These latter effects include such things as fertility problems after treatment of childhood cancers and the risks of second cancers as a consequence of previous treatments. 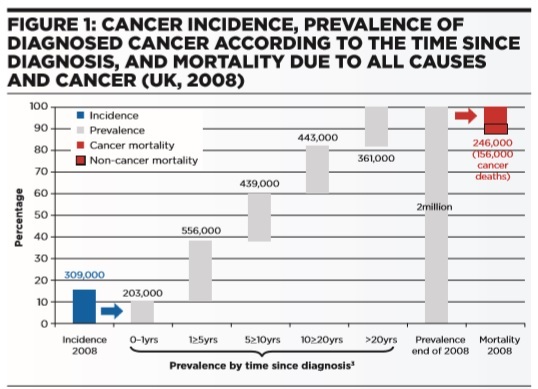 Although data are not routinely collected, current estimates suggest that across the UK as many as two million people are living at various stages following treatment of cancer.2 Using clinically-led assumptions, Figure 1 demonstrates the scale of the challenge of meeting the needs of those who have survived a cancer. With GP practices maintaining a cancer register of those diagnosed since 2003 for nGMS QoF, most should now be aware of who these patients are. Many of these patients will report good health, but by recording a history of cancer and treatment type, clinical and other staff can be alert to the possibility of recurrent disease, and consequences of treatment or psychosocial issues. After oncology treatment is complete, are current care models sufficient? There is a growing recognition that routine cancer follow-up is not as effective as it could be and will not be able to cope with the projected increase in the number of people living with cancer, nor address rehabilitation and secondary prevention needs. For some types of cancer, progressive illness is detected outside routine follow-up appointments. 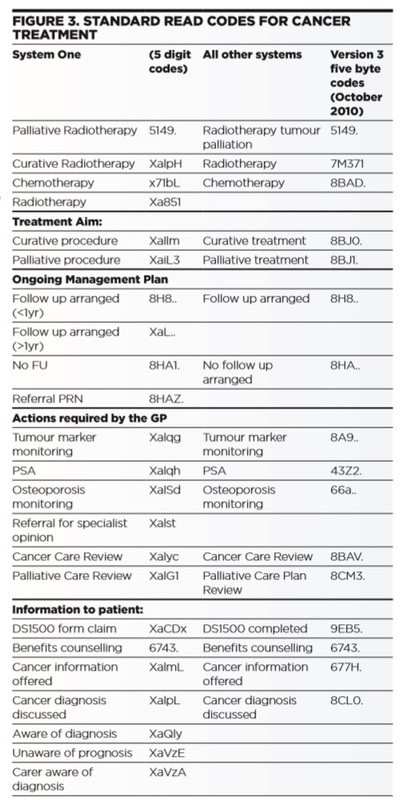 Many primary care clinicians recognise that cancer patients under their care are often unprepared for the sudden transition that occurs upon completion of a course of radiotherapy or chemotherapy. After weeks of intensive treatment and frequent interactions with their secondary care team, they often report feeling lost and abandoned. Many people (and clinicians too) may not be familiar with the description “survivorship care”, and some patients might not consider themselves to be cancer “survivors”. It is important therefore to think instead about how we can help people to “stay healthy”, adjust to a life changing experience and support improvements in their quality of life. Shortly after initial cancer treatment is over, patients can suffer a loss of the self-confidence required to make a good recovery from treatment. This loss of confidence can hinder access to support and recovery. There are a number of ways in which primary care can contribute to improved outcomes and patient experience for this group of patients. Many of these require only an up-to-date cancer register, a familiarity with the risks, services available and “urgent secondary care review” arrangements, and a knowledge of who to contact for additional help. These are summarised in Figure 2 and explained in more detail following. If the practice team is familiar with the list of who has been diagnosed and treated for cancer in the past, it will be easier to maintain a high index of suspicion around presenting symptoms during interactions with the patient. This will facilitate earlier recognition of secondary disease, late effects of treatment, or psychosocial or emotional distress. Updating the register helps recognise that it is appropriate to transfer those with end-of-life care needs to the palliative care register. Identify a person in the practice and a clinical lead who is responsible for adding patients to the cancer register, agree what triggers inclusion in the register and decide when and for what conditions and procedures a READ code is generated for the medical record. The practice team may want to agree the list of READ codes to use, although ideally treatment summaries will include lists of standard READ codes which will make recording and interrogation and analysis of data easier in future. Some of the relevant codes are shown in Figure 3. Oncologists and multidisciplinary teams are being encouraged to categorise patients according to risk of recurrence and the intensity of surveillance required in addition to other indicators of outcomes, such as comorbidity index, psychological risk and treatment toxicity. The multidisciplinary team can then make an informed decision, in partnership with the patient and their family, on their need for continued specialist oncology follow-up or suitability for other tailored follow-up or supported self-management care options. This is not to transfer ongoing management of patients to primary care but to ensure that patients are provided with the correct support to properly address their needs, delivering high quality, safe and responsive care. This is in contrast to the universal models that currently exist but which often cannot respond to the needs of the individual. 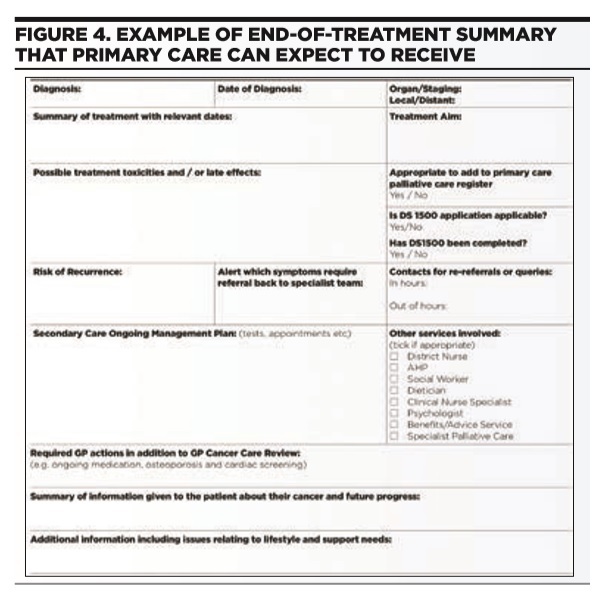 Several studies have confirmed the important contribution that primary care practitioners can make to the care of people diagnosed with cancer, despite the acknowledgment that many GPs are not experts in cancer.3,4,5 Patients appreciate some form of contact from diagnosis, an acknowledgment of a past history of cancer and the opportunity to raise cancer-related issues at future unrelated consultations. Kendall et al have developed a framework4 based on these findings that helps to establish good relationships, offers personalised information and support and facilitates adjustment to life after treatment. This proactive approach to care is employed in the management of other long term conditions and is a well-established prevention strategy. Many practice nurses have developed expertise and have assumed operational responsibility for chronic condition management. Their role in assessment, treatment management, self- management support and follow-up improves adherence to guidelines, patient satisfaction and health status. With many patients now surviving longer with cancer and with other co-morbid chronic conditions, many will already be known to other members of the primary care team, in particular the practice nurse. Treatment summaries generated by hospital units are being used in some areas to inform primary care about the diagnosis, treatment, aims of treatment and likely outcomes for patients in a format that is useful for primary care clinicians. Use of these summaries is still sporadic, but building. Cancer care reviews have been a component of QoF since 2004. Some cancer care reviews are undertaken opportunistically, some are more structured. MacLeod et al found that most practices reviewed physical symptoms, psychological wellbeing, medication and the treatment plan but that information needs, financial issues and carer issues were less commonly included.6 Adams et al suggested that there was scope for improving cancer care review practice that would help better manage the transition from secondary care and improve satisfaction with primary care cancer management.7 Macmillan Cancer Support has worked with major IT suppliers to develop electronic templates to help apply more structure to the reviews. There is increasing evidence of the impact of dietary and lifestyle changes following treatment of cancer. The World Cancer Research Fund review in 2006 suggested excess weight was a factor in cancer recurrence, and a review by Davies et al highlighted the importance of physical activity to protect against cancer recurrence and progression.8 There are now initiatives promoting physical activity in patients with cancer to reduce side effects of treatment, improve survival and reduce relapse rates. It is important that primary care practitioners acknowledge, and use teachable moments to promote, the evidence and encourage physical activity, weight loss and healthy diet, irrespective of a previous cancer diagnosis. Move More and Walking for Health programmes are open to patients with cancer. The holistic needs assessment is now often carried out at various points in the diagnostic, treatment and post treatment pathway, completed by patients but with guidance from clinical nurse specialists and others in oncology departments. Holistic needs assessment is a useful tool in primary care too, particularly for the cancer care review. The holistic needs assessment helps identify the real physical, psychological, social and emotional needs and concerns of patients, although it is important that the needs can then be addressed. A sample for is available at NCSI. Rehabilitation classes have long been a feature of care following cardiac and stroke episodes, but are now becoming more common for patients following cancer treatment. Patients with cancer often experience difficulties getting back to work or financial worries because of the nature of their treatment. This is being addressed by providing access to advice and support from welfare benefits advisors. Although it is unknown exactly what the long term effects of current treatments will be, chemotherapy is known to increase leukaemia and cardiovascular risks and radiotherapy increases risk of further tumours. It is therefore important to identify those who have had cancer treatment – for this, GP records should be reliable. Accurate coding of treatment will help identification of those at risk of future problems. For those patients discharged from regular hospital follow-up, arrangements will be in place to allow rapid access back to secondary care for advice when symptoms or signs arise. It is helpful if the practice team are aware of these arrangements with an easily identifiable entry in the case notes. The cancer programmes in each of the UK nations now recognise that more needs to be done to improve the quality of life for people who have been diagnosed and treated for cancer. The focus has widened beyond acute treatment and it is acknowledged that the improvements in survival must be accompanied by a recognition of the ongoing health and wellbeing of survivors and the consequences of treatment. Primary care has an important and increasing role to play in the management of this growing cohort of people. The evidence base and practical tools highlighted in this article will help equip primary care practitioners to contribute to the provision of high quality, effective care for people affected by cancer.